Delivers significant improvements in the properties of conventional alloys as well as offering the potential to develop and produce new complex alloys. 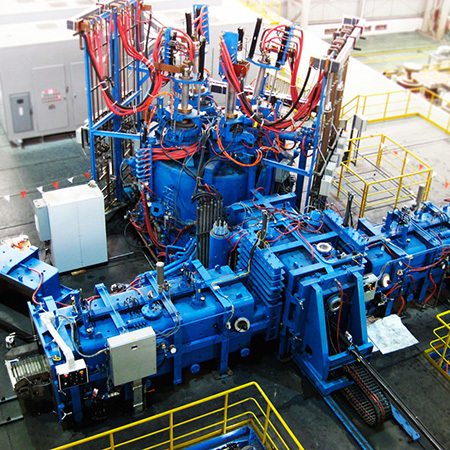 A Retech Plasma Arc Melting furnace uses electrically excited gas, typically Helium or Argon, to melt reactive and refractory metals in a sealed chamber, under inert atmosphere. The Cold Hearth furnace is devoid of contaminating elements such as oxygen and yields clean, as-cast metal by removing high and low density inclusions. Our plasma furnaces can be designed in a wide range of sizes, from a few pounds to many tonnes for production of ingots and powder to castings. The furnaces can be configured with one or multiple torches and with any number of feed systems, as well as casting and withdrawal chambers to suit individual requirements. Retech operates one of the world’s largest and most comprehensive plasma research programmes; as a commitment to remain the world’s foremost producer of Plasma Arc Melters, more than 200 alloys have been melted in our research facility.